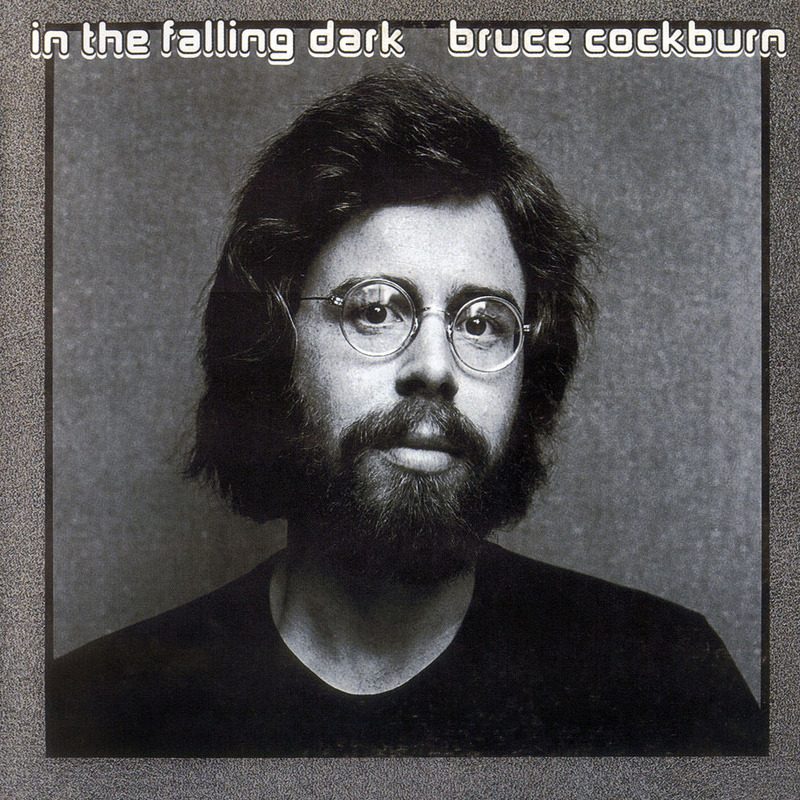 “I felt Bruce was making a special record and we wanted a special cover” says manager Bernie Finkelstein about the process of choosing the artwork for Bruce Cockburn’s 1976 album In the Falling Dark. When all was said and done, two striking photos were chosen – both by skilled and renowned photographers. The front cover, a stark black and white portrait of Cockburn, was shot for the album by graphic designer, artist, and award winning photographer Arnaud Maggs. 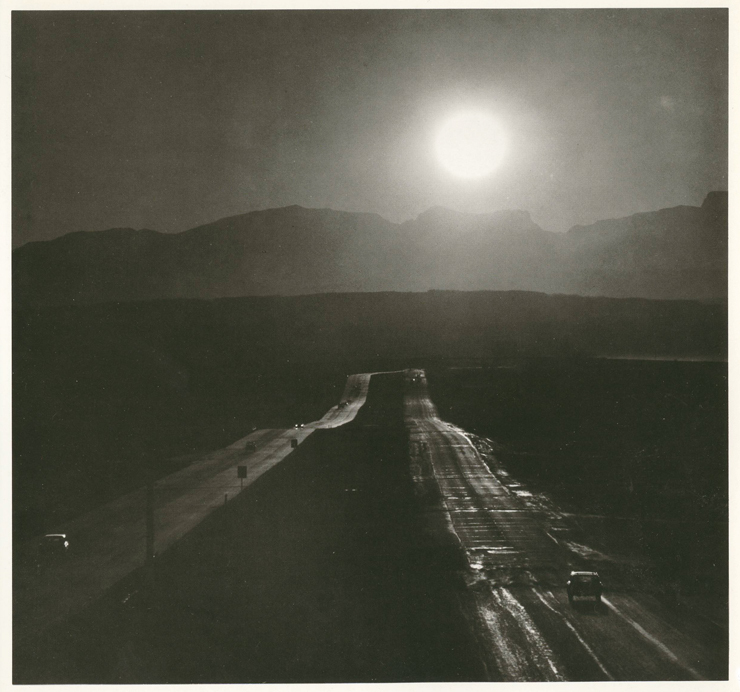 The back cover was an impressionistic, evocative highway sunset photo by “the father of Canadian photojournalism”, Ted Grant. Bruce Cockburn had released six albums by this time, all notable for the care and thought put into their packaging and artwork. In most cases, such as with High Winds White Sky’s snowscape scene and Night Vision’s “Horse and Train” painting by Alex Colville, the cover art perfectly matched the mood of the music within. Finkelstein adds “I think we all felt it was time for a close-up shot of Bruce to be on the cover as he had only been on High Winds White Sky (very small) and Sunwheel Dance (very shaded.) I remember how glad we were to have Arnaud shoot the cover for us.” Maggs was early in his career as an art photographer, but had already been very successful in the graphic design and commercial fashion photography world. A lifelong lover of jazz, he’d even designed the original cover for the famous 1953 album Jazz at Massey Hall. At first glance, the portrait of Cockburn on In the Falling Dark doesn’t seem particularly remarkable. It’s a memorable image, though, and in the end that’s the mark of a well-executed shot. Cockburn looks at the camera with a steady gaze, conveying an honesty as well as a certain mellow intensity. He seems to be saying “I’m a casual guy, but also a serious artist.” The portrait was intended to front an album that was, in a sense, a reintroduction of Cockburn as well as a statement that said this was something new and different for the artist – a “this is me now” collection of songs. It would be his first record to be issued in the U.S. since 1972, plus True North knew they had what was perhaps the strongest album of Cockburn’s career to that point. As the decision wasn’t made to feature a portrait on the front cover until this album, there’s a good chance the back cover photo would have been used for the front instead if it was a year or two earlier. 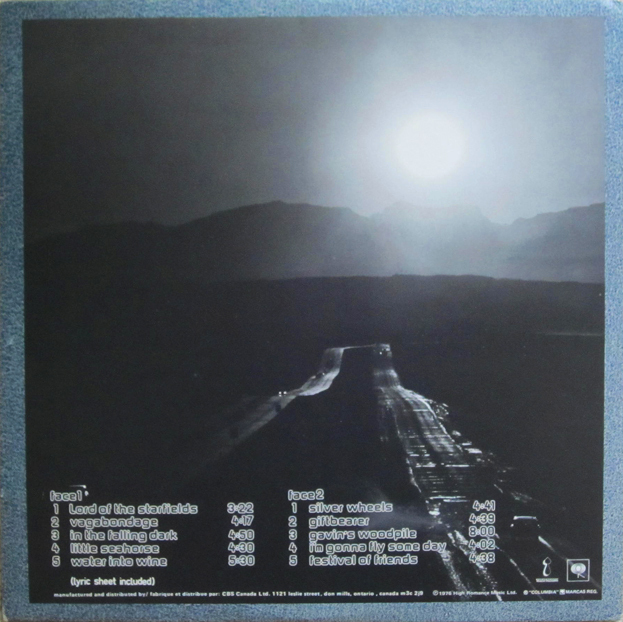 Ted Grant’s photo is a perfect match to the album’s title, as darkness begins to fall with the sun’s descent behind the distant mountains. The photo is moody, full of late afternoon solar-soaked contrast and deep, varied shades of gray and black. It also ties in with the record’s “Silver Wheels”, a song about highway travelling. Schoales, Finkelstein, and Cockburn thought the photo was so appropriate that they also used a cropped close-up of it on the inside of the original vinyl gatefold album. 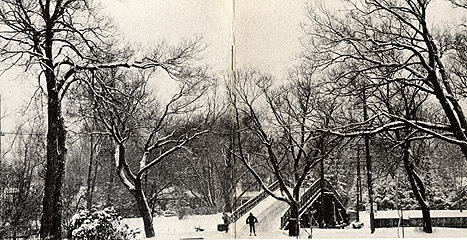 It’s possible that Cockburn first saw the photo when it was part of a 1969 NFB photography/poetry exhibit called “Seeds of the Spacefields” which featured poems by his friend and occasional writing partner, Penelope Schafer. Grant, 85 years old now, has been recently receiving some much-deserved recognition for his long and varied career, as the subject of a retrospective exhibition, documentary, and an illustrated biography (Ted Grant: Sixty Years of Legendary Photojournalism) published last year. Arnaud Maggs died in 2012, but not before a critically acclaimed documentary love story about his marriage to artist Spring Hurlbut and a large overview exhibition honored his work. In the Falling Dark would be Cockburn’s biggest album thus far and the first to chart in the U.S. Well reviewed at the time and since, The Allmusic Guide notes the album “marked his emergence as an important artist.” At the time his most band-oriented album, it also found him about to make a musical transition when some cuts on his following studio album, Further Adventures Of, started taking things in a more rock direction. Falling Dark’s combination of Maggs’ photo – portraying Cockburn in an image addressing his audience directly, and Grant’s – which gave a visual accompaniment to the album title, have now become inseparable from the music.